Global household induction cooktops market size in 2015 was valued at $9,160 million growing at CAGR of 5.8% to reach $13,538 million by 2022. Household induction cooktops market has witness increased adoption owing to factors such as use of electromagnetic energy to directly heat pots and pans. Induction cooktops offer wide temperature range (80&dash;450°F) and different power level options to ensure precise temperature control. The demand for household induction cooktops is high among the urban population especially in the developing nations, due to factors such as high purchasing power, better infrastructural facilities, and increase in working population. Rise in fuel prices for conventional gas cooktops and growth in trend for modular kitchens along with comfortable & safety benefits to the users are the major factors that drive the household induction cooktops market. Presently, induction cooktops are in high demand among working women and urban population, owing to ease of operations and benefits towards healthy cooking. The household induction cooktops have witnessed rapid adoption in the recent years, owing to rise in demand for energy-efficient and time-saving cooking appliances. Moreover, the boom in demand for modular kitchens and implementation of stringent government regulations regarding energy saving contribute to the household induction cooktop market growth. In addition, increase in GDP along with growth in sales of household kitchen appliances further drives the household induction cooktops market growth. However, need for specialized cookware and high initial investment hamper the growth of household induction cooktops industry. Advancements in online marketing and increase in use of digital media for product marketing are the key factors that contribute to the growth of the global household induction cooktops industry. Increase in adoption of technologically advanced and high-tech products is projected to contribute to the growth of e-commerce websites for kitchen appliances, thereby enhancing the market size for household induction cooktops market. The global household induction cooktops market is segmented based on type, mode of sale, and geography. The built-in induction cooktops segment has a major share in the household induction cooktops industry, followed by free-standing & portable induction cooktops. The manufacturers focus on the quality and innovation in the product, owing to which the market is estimated to witness a surge in the demand for all the segments. The key players profiled in the global household induction cooktops market report include LG Electronics, Inc., Whirlpool Corporation, Panasonic Corporation, Koninklijke Philips N.V., TTK Prestige Ltd, Sub-Zero Group, Inc., Electrolux Group, Robert Bosch GmbH, Miele Group, and SMEG S.p.A. Panasonic Corporation holds the highest market share among other players operating in the global household induction cooktops industry. The global household induction cooktops market is segmented based on product into free-standing & portable and built-in (integrated) cooktops. In 2015, built-in (integrated) induction cooktops was the highest revenue generating segment and is expected to dominate the market throughout the analysis period. The mode of sale could either be retail or online sale, wherein retail mode includes brand outlets, franchise stores, departmental stores, and retail outlets. Most customers prefer the retail mode of sale while buying kitchen electronics. However, online mode of sale steadily gains momentum and is expected to grow at the highest CAGR of 7.6% during the forecast period. Increase in health consciousness, technological advancements, rise in disposable income, energy-efficiency of the cooktop/ energy consumption, better safety features, need for specialized cookware, and adoption of smart household kitchen appliances majorly impact the global household induction cooktops market. Along with these factors, the global market also depends on consumer awareness and performance of induction cook-tops. All these factors collectively contribute towards the market growth, while some of them limit the market growth. The below chart represents the impact of the drivers and restraints in the current scenario and their impact analysis during the forecast period. Rise in industrialization and commercialization has increased working class population especially in the developing countries, such as India and China. This has increased the overall disposable income of the individuals. As per International Monetary Fund (IMF) GDP growth trend, the economic activities in advanced and developing economies is projected to grow at 3.6% in 2017 and is expected to maintain this trend during the forecast period. Therefore, the impact of economic improvement and GDP growth is expected to drive the global household induction cooktops market during the forecast period. Growth in working class population paired with increase in trend of consumption of fast food have increased health consciousness among the customers. Nowadays, demand for induction cooktops that cook food easily with less oil content has increased, in turn positively affecting the induction cooktops market. Automation and automatic operation of household kitchen appliances are in high demand among customer in the developing nations. Busy lifestyle and sophistication in daily life activities are the two key factors leading to adoption of automated induction cooktops. Rise in number of working professionals has led to time constraints for performing routine tasks, which has in turn increased the demand for induction cooktops. Owing to electromagnetic field technology, induction cooktops heat 50% faster than the traditional gas cooktops and allow instantaneous temperature changes as the power level is adjusted. The impact of this factor is expected to increase during the forecast period. Asia-Pacific and LAMEA are the two important regions that hold immense growth potential for this market. Technological advancements and growth in awareness among consumers are the key factors that encourage consumers to shift from conventional cooking systems to induction hobs. The continuous improvement in standards of living in these regions has posed lucrative opportunities for market players to expand their foothold in the Asia-Pacific and LAMEA regions during the forecast period. 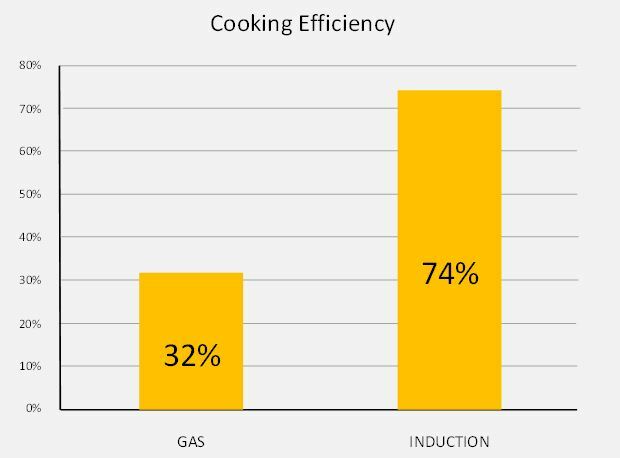 The above graph represents the energy-efficiency of induction cooktops as compared to gas stoves. Induction cooktops are eco-friendly in nature and is 74% efficient at transferring and transforming the input energy to the pan placed on the surface of induction cooktops, compared to gas ranges, which are nearly 32% efficient. This report provides an in-depth analysis of the global household induction cooktops market to elucidate the potential investment pockets. The current trends and future scenarios are outlined to determine the overall market potential and single out profitable trends to gain a stronger foothold in the market. This report provides information regarding key drivers, restraints, and opportunities along with their detailed impact analysis. Quantitative analysis of the current market trends and future estimations for 2014-2022 are provided to indicate the financial competency. Porter’s Five Forces Model of the industry illustrate the potency of the buyers and suppliers. Fisher & Paykel Appliances Holdings Ltd.
Household induction cooktops works on electromagnetism, which is used to heat the pan placed on the cooktop. These cooktops offer energy efficient cooking solutions to the consumers. The household induction cooktops market is segmented into built-in (integrated) induction cooktops and free-standing & portable induction cooktops. The built-in induction cooktops are utilized by the large houses where there is ample kitchen space and modular kitchen designs can be supported. Household induction cooktops are convenient and safe to use as they don’t have open flames. The improvement in living standards, rise in per capita income, and widespread adoption of electronic kitchen appliances by consumers are expected to boost the growth of the household induction cooktops. For instance, in January 2017, Usha International, one of India’s leading consumer durables company, launched Usha Induction cooktop IC 3616 in its induction cooktops range. This cooktop is equipped with pan sensor technology wherein the process of heating will start only when the cooktop detects the utensil. This also prevents overheating by automatic switch, of the appliance, to power saving mode. Need for specialized cookware for induction cooktops and low awareness among the people in developing countries regarding the benefits of the induction cooktops is likely to hamper the growth of household induction cooktops industry. However, advancements in design of induction cooktops and rise in prices of fuel such as LPG & gas and increased performance of induction cooktops are expected to boost the market growth. Leading players have collaborated with other companies to expand their product portfolios and increase their presence in terms of outreach and customer base. 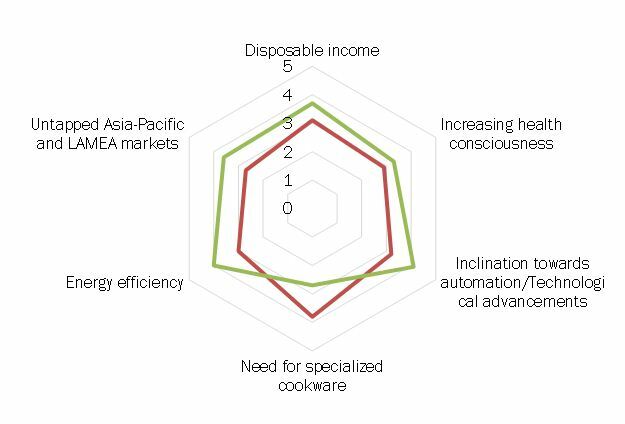 Europe is the leading revenue contributor to the global household induction cooktops market, owing to increase in demand for electrical kitchen appliances from European consumers and high purchasing power of the consumers. In the near future, the Asia-Pacific region is expected to witness rapid growth, owing to the significant adoption of efficient cooking solutions and increase in product offerings from local as well as international brands and economic development among various countries in the region such as India, China, Singapore, and Australia.